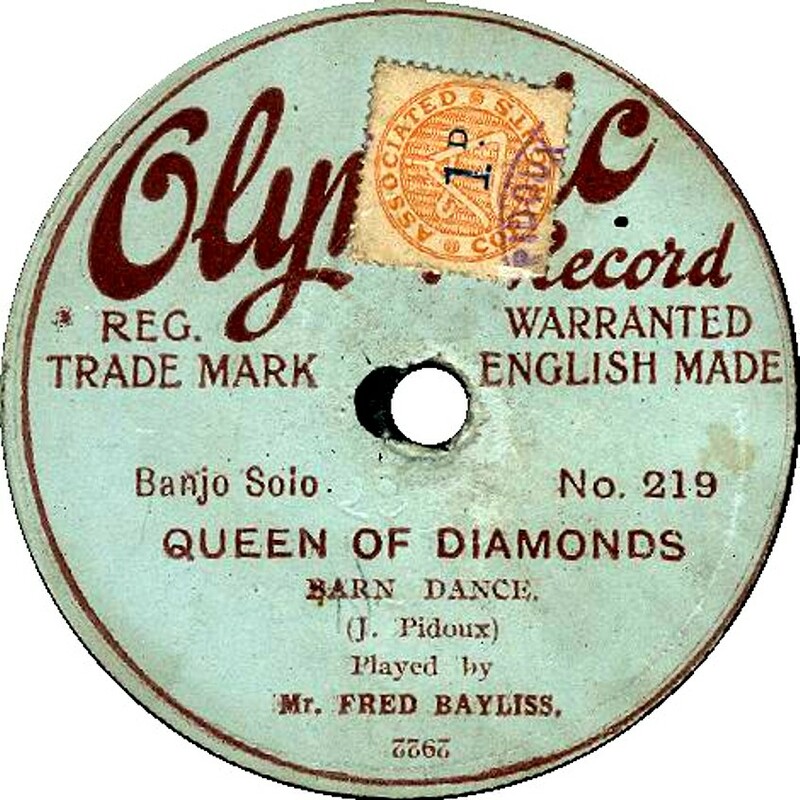 British 78rpm record labels whose name begins with O. Using the letter links below you can see pages for other letters. Octacros Octacros records were produced as a result of a dispute between Cinema operators and the major record companies, who wanted to charge an extra fee (as well as the fee to the PRS) for use of their records in cinemas. 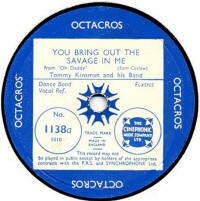 To circumvent this rather typical high-handed attitude, Synchrophone Ltd produced Octacros records. 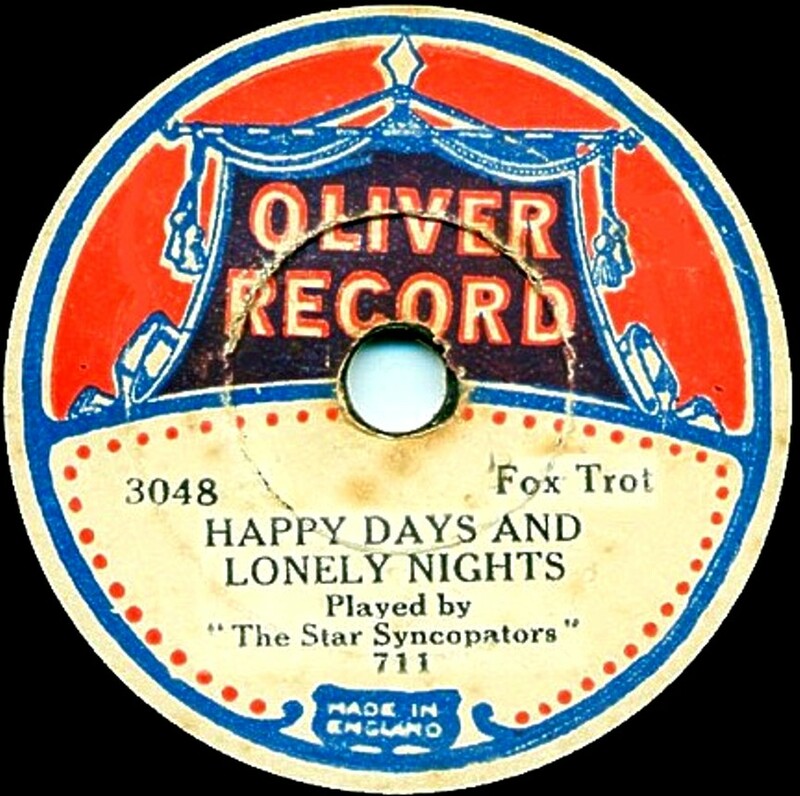 These records first appeared in 1934, using old masters from the defunct Piccadilly label, with a 3-digit catalogue number. 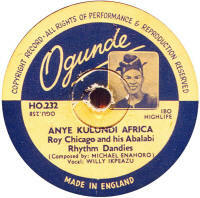 There was also the 1000-series of new recordings and the 2000-series of continental recordings. The company was taken over and closed by Decca in 1937, effectively creating a duopoly of Decca & EMI. 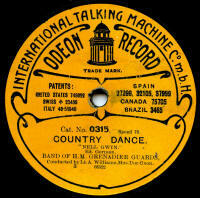 Odeon The Odeon record was a major international label during most of the 78rpm period. I am concerned here only with those made for British consumption. The trade mark was registered in Britain in 1904 and the actual records appeared soon after. There were two sizes, 7½" and 10¾", costing 2/6 and 5/- respectively and were double-sided at a time when all records were still single-faced. Some of the British issues were "paste-over" on the original German ones and some had the British label pressed in, in the usual way (see image). 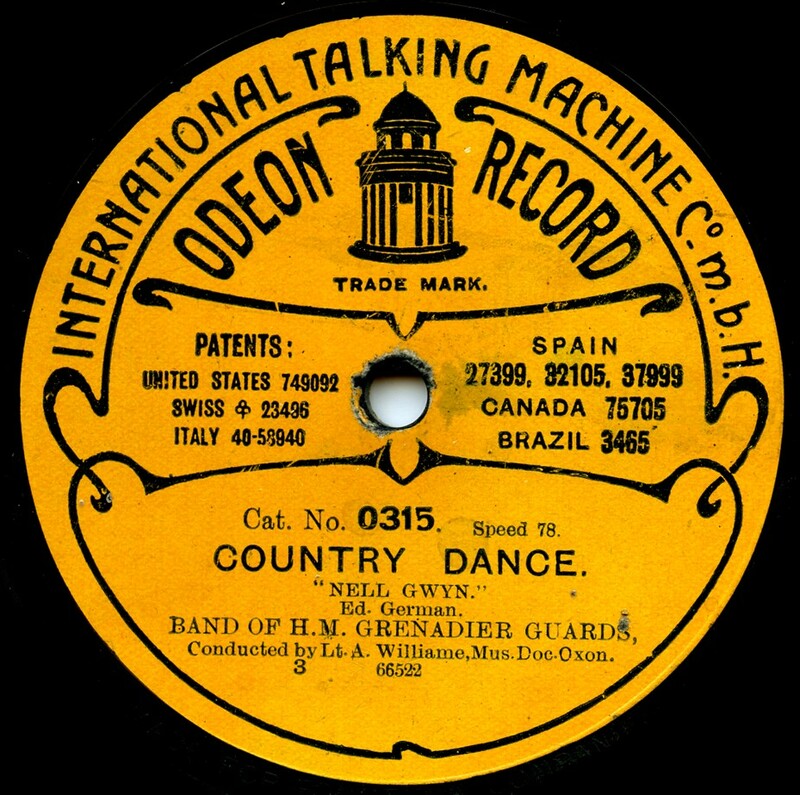 The outbreak of WWI in 1914 meant that German-produced records such as Odeon ceased to be available, but during the 1920s & 30s, certain Odeon records were sold in Britian, almost at random it seems, using Parlophone/Lindstrom masters. 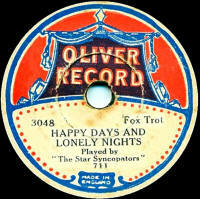 A listing of British Odeon records, compiled by Mike Langridge is available from the CLPGS. 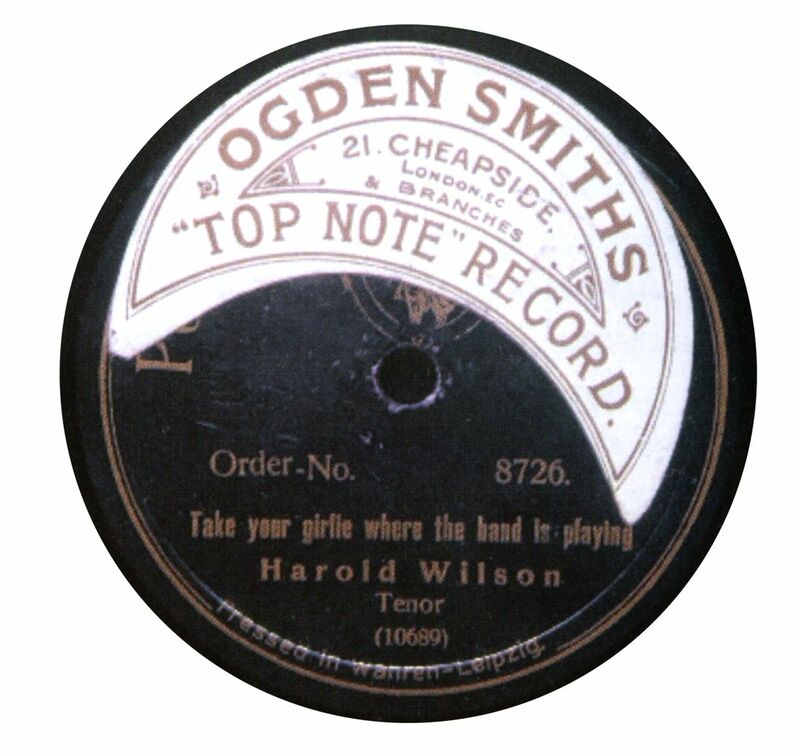 Top Note Ogden Smith was a bicycle accessories dealer in Cheapside, London (with branches elsewhere), trading between 1910 and 1915. During this time he also sold records overstuck with his own label on the upper half, obliterating the original label's name. The few examples I've seen were Polyphon Records, most likely old-stock (which were also sold by Lugton's). It is unlikley, in my opinion, to be due to the outbreak of WWI, since the place of manufacture (Germany) is still visible at the foot of the labels. 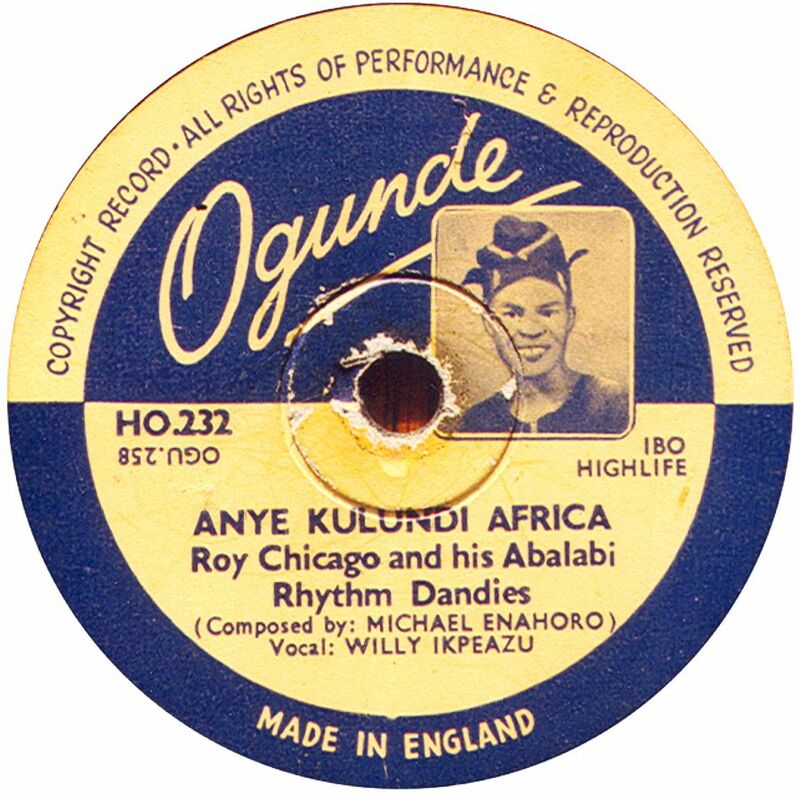 Ogunde Nothing known about this record, which was made in England by an unidentified manufacturer, and likely exported to Africa. Okeh Okeh are, of course, a well-known American record company, founded in 1918 by German emigrant Otto Heinemann. From 1919 and for probably a very short period afterwards, Okeh records, both lateral and vertical cut, were imported to Britain. The Phono Exchange in Cardiff, was reported to be the only place selling OkeH records at this time, with prices of 2/6 for vertical-cut records and 3/6 for lateral. They rarely turn up, but are recognisable by the British copyright stamp affixed to the label. 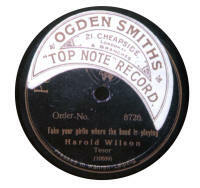 From 1922-23, Okeh masters were available in Britain on Parlophone. 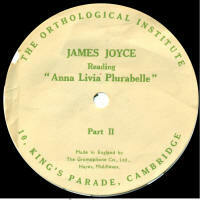 The image, right, is courtesy of Norman Field from his excellent website, http://early78s.uk/. Oliver Another of the Crystalate 'mini' disks, Oliver seems to vary in size between 5½" & 6", similar to Mimosa, and also 7", these dating from about 1930, using masters also available on Victory. Like Mimosa, they were available from the early 1920s until about 1930. 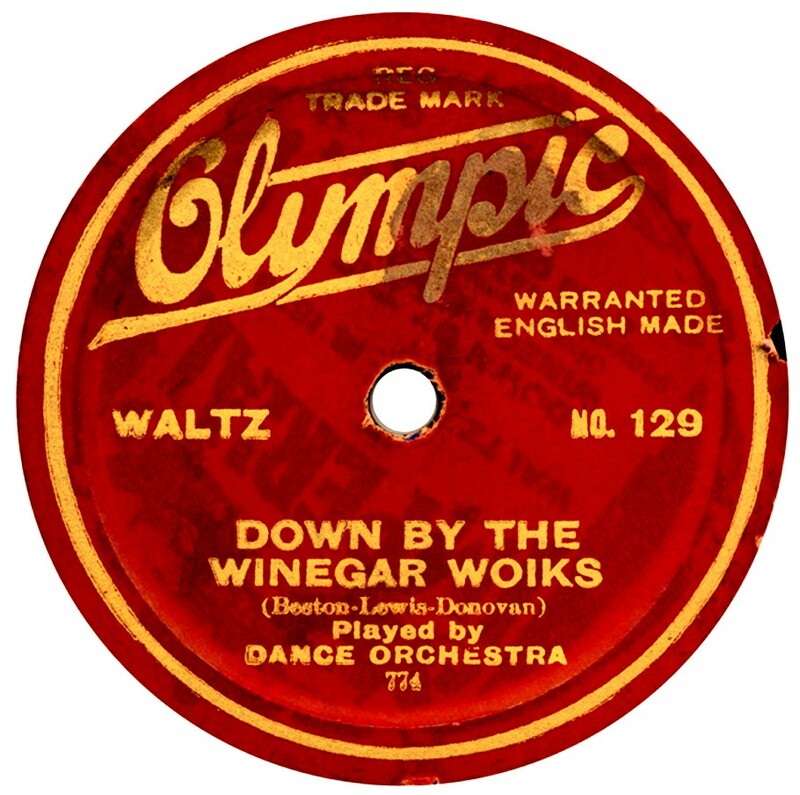 It had not been found out who these records were produced for, but the label's design is almost identical to the CLAUSOPHON label made in Germany. Olympic Olympic records were produced for Levy's Phono and Cycle Stores of High Street, Whitechapel, London. There were three series produced; all were manufacture by The Crystalate Manufacturing Company. The first series used Grammavox masters (Sound Recording Compamy) and had a violet label with gold printing and had JA- prefixed catalogue numbers. These date to just prior to WWI. The second series dates from 1919 to about 1922. These used "Popular" masters which also belonged to the Sound Recording Company. The catalogue series ran from 100, with no prefix. The labels were usually red, but, like Popular, the colour could vary depending on the paper the company could get. Finally, in the mid-1920s the label made its third appearance, the masters now being Crystalate's own, also issued on Imperial. Just to confuse things, these also used a 100- series catalogue range. The labels were red with gold printing (similar in style to the second image here). Many, if not all, are just pasted over standard Imperial pressings. Sometimes these have the same catalogue number as the original Imperial issue. Thanks to Rainer Lotz for the scan of the pale blue/green style, and to Norman Field for the 1920s paste-over image. Operaphone Despite the label name, nothing operatic was ever issued on it. The fare was the usual popular song, music hall and orchestra music to be found on other cheap records of the period. They were pressed in Germany from Bel Canto, Beka (and other) masters during 1913-14. 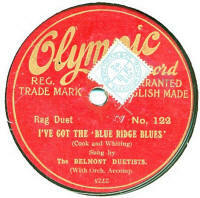 The labels state various places of manufacture in Germany, implying that more than one company was making these records. The London agent was The Operaphone Company Ltd, of 23, City Road, London, a district that seemed to have been stuffed with record & gramophone businesses at this time. 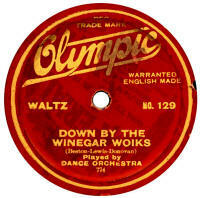 Ther are two known designs of thr label, one showing a winged cherub, which prompted The Gramophone Company to sue for trade mark infrigement, since they used a similar image on their records. This may explain the change of design of Operaphone records. The outbreak of WWI caused closure of the business. 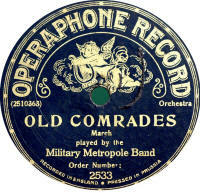 Over 276 10" records and about 76 12" records had been issued on Operaphone. Thanks to Bill Dean-Myatt and Rainer Lotz for providing the label photos. Oriole This was another attempt at the record market by Levy's of London (see Levaphone). 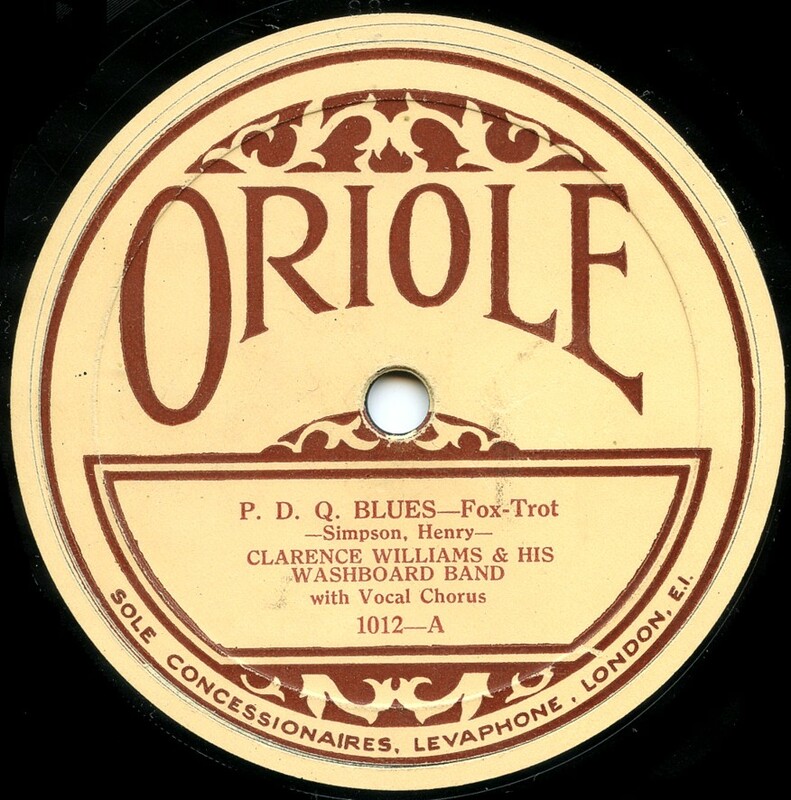 The first of 4 different series of Oriole records were released in May & June 1927, and 15 different records were released, though the recordings generally dated from a year or two earlier. They were all from American Vocalion's "race" catalogue and numbered 1000 to 1012 plus 2000 and 2001 for 4 sides by white cabaret artists. 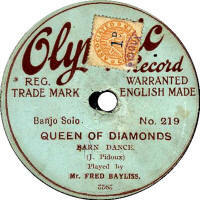 The P-100 series dates from the early 1930s and the label is either gold (see example) or silver. In the mid-1930s, there was a short-lived LV-100 series, gold labelled with the same design as the earlier 30s P- series. These were re-issued in the 1950s as LB-series, using the original masters and a new-design of label in Black with silver printing. Then in the 1950s, they used a CB-catalogue series, reissuing (again) the 1930s sides and then also new recordings, selling for 5/9. 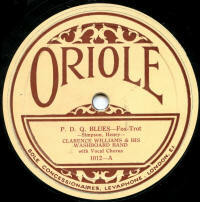 Levy's Oriole company also made personal/private recordings on request, and these generally have an orange and gold label. 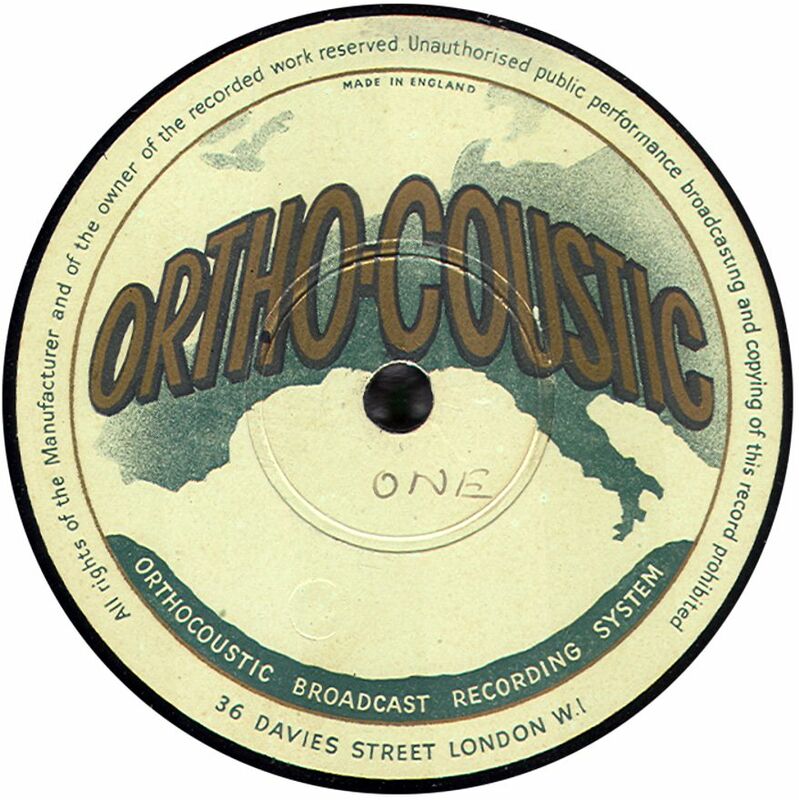 Orthocoustic Thanks to Bill Dean-Myatt for providing the label image. 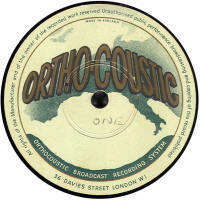 Orthological Institute Thanks to Bill Dean-Myatt for providing the label image. Our Flag One of many hard-to-find pre-WWI labels, Our Flag was pressed by Kalliope in Germany using their own masters and those provided by J. Blum & Co.. They were sold though Philip Waldman of 249, Old Street, London from 1913 to 1914 when WWI put a stop to all German imports.